-- Small Vanes Big Problems? -- Robin Hood Shoots Trueflight! -- No "Bird Flu" in Trueflight Feathers! Trueflight's "Bight StripesTM" line of colorful barred patterns just got bigger... and brighter! 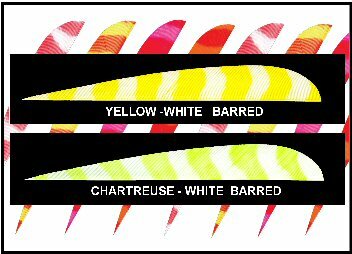 We've added a Chartreuse and White stripped pattern and a Yellow and White stripped pattern. Then new colors make a total of 6 "Bright StripesTM" choices all about the brightest, most "eye catching" arrow fletching archery has ever seen. We've been very happy to see steady increases in "Bright StripesTM" sales. In fact, every distributor who's ordered them has later re-ordered them -- in bigger quantities. For years it's been well known that plastic vanes tend to be much heavier than the same sized feathers. This added weight reduces arrow speed and makes the arrow more tail heavy and less stable. Well our "high tech" plastic friends found a way to reduce their vanes weight -- they chopped off the front of a 4 inch vane and made a 2 inch vane! That's about the most straight forward way to save weight I can imagine... (except for maybe using no vane at all!) Unfortunately there is the small matter of arrow guidance which is pretty "iffy" even with full sized vanes. These little vanes open up a whole "pandora's box" of unsavory possibilities. Accuracy is and always has been the most important goal in archery. If you can't hit what you're aiming at, you might as well play the lottery. Accuracy is what kills game. From the beginning, thousands of years ago, human beings knew that an arrow without some sort of "fletching" on it's tail flew anything but straight. This random "yawing" or "fishtailing" as the "pointed stick" flew meant not only that it's impact point was unpredictable, but also that it was likely to hit at an angle. Hitting at an angle meant little or no penetration of the target very bad if hunting an animal. Thank goodness some genius thought of attaching feathers to the rear of the "pointed stick" inventing The Arrow. That small addition turned the "pointed stick" into an aerodynamically stabilized projectile. Remarkably, a few grains of carefully selected feathers on the rear of the "stick" made it fly straight and fly consistently. It must have seemed like magic. Suddenly accuracy was limited by the skill of the shooter, not the equipment. What happens when we replace standard sized feathers (say 4 inch) with plastic vanes half their size? The stability of the arrow decreases. This means the arrow's consistency in flight decreases, effecting accuracy and the angle of impact. Is it possible for an arrow to fly "half way straight" with small plastic vanes? Maybe provided the release is perfect, the bow is set up perfectly, the shooters form is perfect, and absolutely nothing disturbs the arrow in flight. The trouble is few things in this life are perfect or stay that way for very long. Hunting in field conditions exposes both the shooter and the arrow to many constantly changing environmental variables crosswinds, the touch of a twig or branch, non standard shooting position, cold fingers, etc. Any of these variables can and will effect accuracy and arrow flight. It is the job of the arrow's fletching to return the arrow to straight flight despite any disruptions it has to deal with. Virtually everyone agrees that feather fletching does a tremendous job of quickly stabilizing an arrow even in the face of unexpected variations in shooting form and the environment. The "Buck of a Lifetime" comes along once in a lifetime. Can you assume that all aspects of your "Shot of a Lifetime" will be 100% perfect 100% of the time? "More weight less guidance" -- That's a slogan we'll be happy to leave to the plastic vane folks. Is Bowhunting a Humane Activity? Back in time, to about the late 1950's, I came in possession of a news letter, or news release of a chapter of the Humane Society, or like organization that was refreshing. At this time, bow hunting was hardly on the radar screen as gun hunting was the big thing. I suspect less than 1% of deer hunters were bow hunters. The article I am referring to stated that if you had to kill an animal, one of the most humane ways to do it was with a sharp arrow head. Even gassing causes suffering as the animal searches for clean air before collapsing. In the early seventies, I was guiding a single bow hunter. He was from near Chicago and was into bow hunting and falconry (Hunting small game with birds). Now, in those days, groups of hunters, 15 - 20 or more (Like Art Laha's camp did a few miles away) would line up on a road and 3 or 4 drivers would go « mile or so down wind and walk toward the standing hunters. Tree stands, or elevated platforms were outlawed at this time. It was all ground hunting. Of course, with a single hunter to guide, this wouldn't work except perhaps at a choke point between two lakes etc. So this left two other means to get a deer. Road hunting, is where you drive the back roads and spot a deer in the woods. Now you can go down wind and slowly - stopping a lot, walk toward the deer until you see it and then position yourself ahead of where it's feeding and wait for it to come within range for a shot. This works well with a single deer but a doe with 2 fawns are next to impossible to get a shot as 3 sets of eyes are looking for danger. Deer always feed down wind and if they see danger, they run upwind. The wind at their back is sweet and clean so their eyes take over when looking down wind. Only move when they have their heads down feeding. They seem to have a photographic memory - when they look down wind, their mind takes a picture. If anything different is added to the picture the next "look", they know it's not the same picture as before. We were "road" hunting and saw a large doe about 150 feet from the road, feeding in the woods. We drove past her then stopped - got out and walked back. As we got near her, we stopped until she had her head down feeding, then moved a bit closer to get a clear shot. She would raise her head and look at us but did not recognize any danger, so she would go back to feeding. When she had her head down and he had a clear shot, he shot. The arrow went completely through her. Her head jerked up and she flinched like a bug bit her. She looked directly at us, we froze and didn't move, and she went right back to feeding! Another 30 seconds or so, she fainted from lack of blood and fell over on the spot. Case no.2: I was stalking, hunting alone and worked up to a buck feeding down wind. When a clear shot presented itself, I waited until his head was down feeding, and again the arrow went completely through him. He also flinched as if a horsefly or bug bit him and he turned around in a tight circle, trying to chase the fly away from his body. He also fainted from lack of blood a few seconds later and collapsed on the spot. Even after breaking rib bones, neither deer was in pain. I'm sure other bow hunters have experienced similar situations. Here in the US and in several other parts of the world, we are very fortunate to have some excellent distributors doing an important job of supplying archery dealers efficiently. Archery manufacturing businesses tend to be small companies specializing in a limited range of archery products. (Here at Trueflight we are definitely small and definitely specialized -- we sell only Archery Feathers.) Any one archery manufacturer is unlikely to produce and stock at all times all items needed by an archery dealer. A dealer wanting to build arrows, for example, likely needs the products from many different manufacturers shafts, heads, nocks, fletching, etc. If a dealer were to order from each manufacturer this would take a lot of time and attention sending in orders, checking each shipment, making payment, and so on to each manufacturer. This also would incur "shipping and handling" charges from each manufacturer. Ordering through a distributor is much faster and easier and will result in a single shipping and handling charge. Shipping and handling are not cheap. The more items that can be combined on a single order -- the lower the cost is per item. 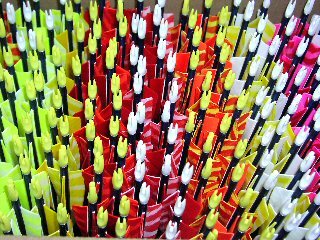 Archery distributors are also very good at assembling and processing orders. As a manufacturer, our computer systems, shipping systems, and accounting systems are not set up for large numbers of sales. We work very hard at producing the best feathers we can, as efficiently as we can. Distributing is a very different business requiring radically different systems, personnel and financing. Archery distributors produce very good catalogs which are an invaluable resource for any dealer. These catalogs seem to show every possible archery related product a dealer might need. Distributors also maintain large inventories ready for immediate shipment. Many small archery manufacturers simply cannot economically maintain ample stocks of all items at all times. Archery distributors are doing a great service to both manufacturers and dealers. And they are doing it very efficiently. I don't think it's an exaggeration to say that Archery today would not be as popular and available as it is today without the efforts of our Archery Distributors. Our good friends at Arms and Archery in England tell us that our feathers are being used in the new BBC "Robin Hood" TV series. We're sure happy that ole Robin (or maybe NEW Robin) knows quality feathers when he sees them! Local movie buffs have also told us that Trueflight BarredTM are prominently featured in the movie, "The Weatherman", staring Nicolas Cage. We haven't seen the movie our selves, but there sure is a nice shot of Trueflight BarredTM on the cover of the DVD case. Trueflight Feathers have appeared in many recent movies including "Braveheart", "The Gladiator", "Lord of the Rings", and "Timeline". It's nice to know that Trueflight Feathers not only work great they also look great. Aesthetics are a big part of archery and are without question a significant factor in archery equipment sales. Trueflight Feathers and "Bird Flu"? Medical research has determined that exposing the virus to elevated temperatures for certain lengths of time deactivates (or renders harmless) the virus. (See www.ecolab.com/avian_influenza/ for example). Trueflight's normal processing temperatures and durations have ALWAYS been much greater than the minimums known to destroy the virus. In addition, our processing chemicals and water temperatures alone are believed sufficient to destroy any virus. Further all of our feathers are domestic turkey feathers grown in the US on turkey farms. We do not use feathers from any wild birds. Dangerous bird flu strains have not been detected at all in the US. All US turkey farms as well as all US turkey processing plants (where we obtain the feathers) are subject to regular and very exhaustive USDA (US Department of Agriculture) inspections. The USDA is a federal agency which takes the bird flu very seriously and is very much on the look out for any sign of it. Our own processing plants are also subject to regular USDA inspections. Generic "Bird Flu" (or "Avian Influenza") is common and endemic in many parts of the world, including North America. Only one particular strain is thought to pose any risk to humans; the H5N1 strain. There are however many variations of the H5N1 virus, only one of which is dangerous to humans. As of the fall of 2006, although H5N1 has been seen in North America, no samples have turned out to be the hazardous variety. If requested by overseas customs officials, our USDA will provide an official "USDA Plant and Animal Health Inspection Certificate" with each of our feather shipments. There is an approximate $32.00 charge for this certificate. As of March, 2006, these certificates have been required by most countries outside the US. All shipments accompanied by the USDA certificate have been accepted by their destination countries without problems. Andrae EAcuisto, owner of Lone Wolf Treestands, with his new number 2 Wisconsin State Record Whitetail. 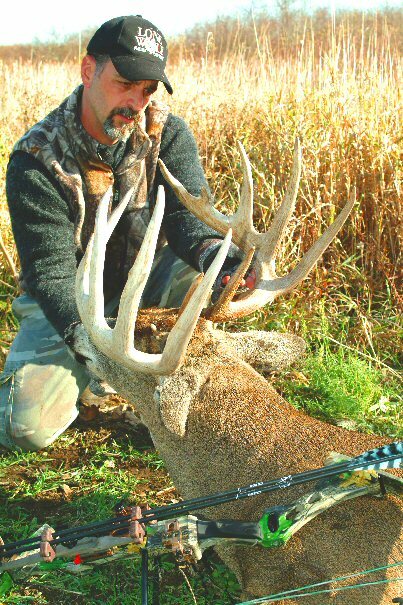 Andrae's whitetails now occupy #2 and #3 in Wisconsin Records. Ralph Ramos with his awesome Mountian Lion. Trueflight's Bright StripesTM sure look good with Ralph and that lion!. Text and Photos copyright 2007, Trueflight Mfg. Co., Inc.